Carpe Memoria: Why Club Scrap? There are a LOT of scrapbooking companies. Some specialize in particular items like stickers or fibers or eyelets. Others sell just about everything under the sun. And you can shop for products on-line, in shopping plazas, at Wal-Mart or Target, and at scrapbooking home parties. Believe me, I've shopped all those places! There is so much out there, so much available, that it can be overwhelming, right? So, how do you know where to shop for products, and how do you find products that you will love and, hold onto your seat, use??? When I first started scrapbooking in 1997, my products came from the few local stores I could find and Wal-Mart. I was having a hard time finding a place that was convenient and also had quality products. I wasn't happy putting my beloved photos on papers that were not much more than printed copy paper, but that's what I did for seven years. In 2002, when we had moved (yet again), and the closest scrapbooking store was over an hour away, I started a quest to find something else, though at that time I didn't know what I was really looking for. In a magazine, I found an ad for a scrapbooking club. "A club?" I asked myself, "why would I want to subscribe to a club?" "Well, my dear," myself replied, "let's check into this and find out." So I went to http://www.clubscrap.com/ to check out this interesting phenomenon, not realizing I was taking my first step down a road to scrapbooking bliss!! So, what is it, you may ask? 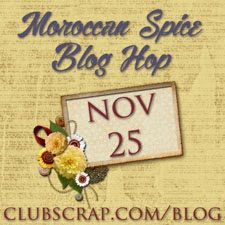 Club Scrap was the first of-the-month scrapbooking club. It was started in 1999 by Tricia Morris and Dinah Mueller, two women in Wisconsin. From the beginning, their goal has been to create high-quality scrapbooking products and sell those products in themed monthly kits. Each Member receives her goodies in a pizza box delivered straight to her door. 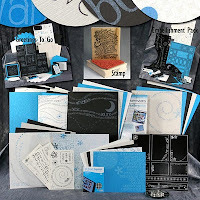 These kits don't just contain paper; they have wood-mounted stamps, fibers, metal embellishments, stickers, stencils, unmounted stamps...everything you need to create classy, beautiful, and quality scrapbook pages. And 98% of the pizza box items are created by those great ladies in Wisconsin and their staff...they don't pull from other companies' products...they design each element of the kits, on occasion adding a unique item from another vendor that enhances the kits. Sounds pretty amazing, don't you think? But, wait, there's more! Club Scrap also creates cardmaking kits, projects, and digital kits...all around a particular theme each and every month. Their design team must work overtime creating all those unique products. Take a look at this month's kit. This very creative kit is called Expressions, and that's just what the artwork portrays--expressions of various sorts--in a palette of white, black, and luscious blue. This is truly a fun one! Want to experience Club Scrap for yourself? Contact me today, and I can get you started. And you, too, can take your first step on the road to the ultimate in scrapbooking creativity and bliss.